PREMIUM QUALITY – Durable, high quality cotton canvas and pine wood poles. 100% satisfaction and quality guaranteed! REMOVABLE FLOOR MAT – The floor mat adds an extra layer between the indoor play area and ground. 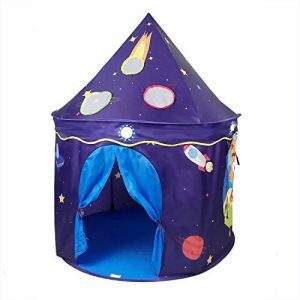 ★ Special Edition – This unique kids play tent is special for any boy and girl who is carrying a dream to become a little astronaut! Also perfect for children who like space or spaceship stuff! Comes with FREE STAR LIGHT STRING. 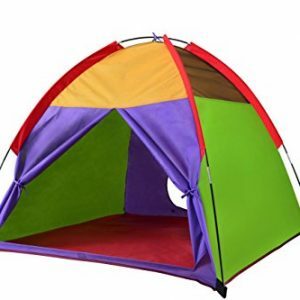 ★ Premium Materials – Top quality environment-friendly fabric, 100% polyester-nylon, more sturdy fiberglass poles and high-strength flexible steel, much better than other cheap tents. ★ Breathable – Two mesh window and one big opening door design assuring a better and safer ventilation environment. Wood Dowel:Solid round poplar wood dowels (1″ diameter) sanded without sharp edges,kid and wood floor safe. Dimensions: 42X42″ square footage base,1.6 meters tall. 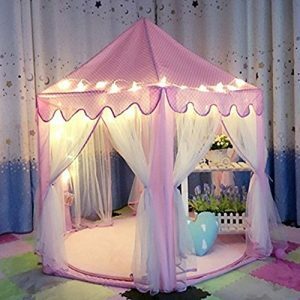 【Keep Kids Occupied With Fun】Leave you more time for house work or leisure etc when kids are occupied with fun to play inside the tent. 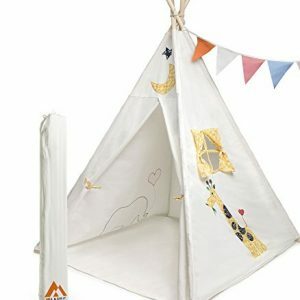 【Unique Design】Kids tent is designed with imaginative viking patterns, 6 flags allow kids to DIY write what they like. 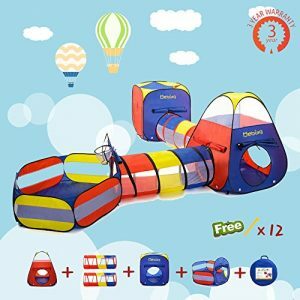 【Portable & Lightweight】1.1KG with 44*34*2CM after folded is easy to take outdoors when you need to go for park or beach etc to play with kids. 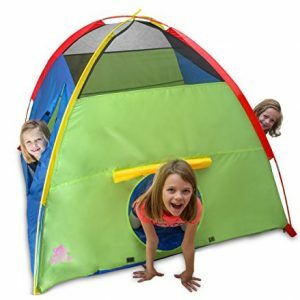 Tent Dimension in inch: 55″ (Diameter) x 53″ (H). 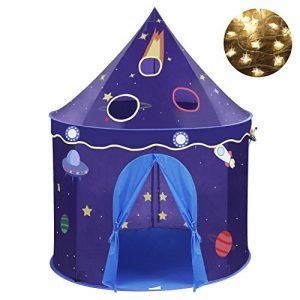 Specially designed hexagon, provide a perfectly sized space, giving your children plenty of room to stand and play, even an adult can fit inside,Includes 23 feet star light, use the 4.5 v batteries, super safe,Let the child have a wonderful night. 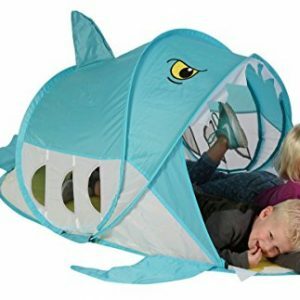 Playing dress-up, have fun with friends, or read, etc, your kids will love this play tent definitely! Encourages dramatic play and provides hours of fun for kids! 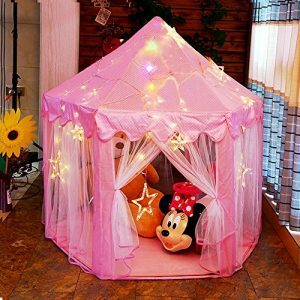 Inspire children’s imaginations while giving them a private space of their own,Quality Material,Polyester pongee,A soft, let children fondle admiringly. Easy to move or take down when not in use. Comes with a carrying bag, making it easy to store when it’s time to put the tent away. 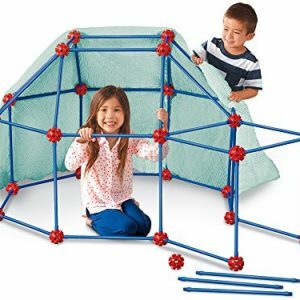 Be excellent for indoor or outdoor play! 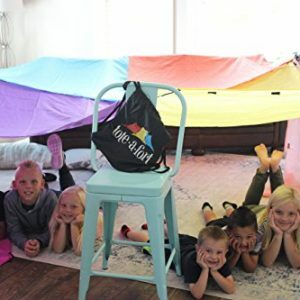 ★★ INSPIRE FUN, CREATIVE PLAY ★★ – The Kiddey Kids Play Tent & Playhouse spurs creativity and imagination in kids of all ages, helping build critical thinking skills, independence, confidence and social bonding with friends and family. 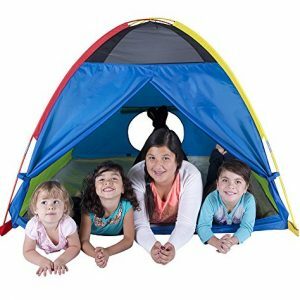 ★★ EASY SETUP & STORAGE ★★ – Each kid’s tent sets up quickly and easily thanks to flexible tent poles and in-ground stakes that keep it in place. Better yet, it comes with a convenient carry bag to store it away when you’re done. 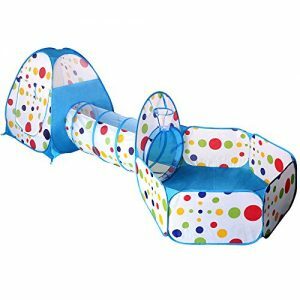 ★★ LARGE SIZE, MULTIPLE ENTRANCES ★★ – Unlike other playhouses that only have a front door, ours features a Velcro front door and two “tunnel” windows; both with roll-down flaps for easy access. 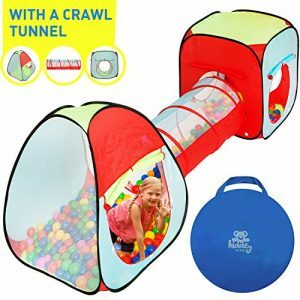 Your kids can walk or crawl in easily! 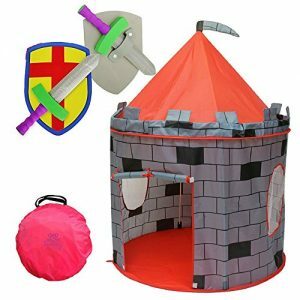 ☛ FREE BONUS INCLUDED “SWORD & SHIELD KNIGHT SET” ☚ UNLIMITED IMAGINATION-Thanks to its unique and smart Knight’s Castle kids Play Tent design it will make your kid’s imagination run wild. Countless scenarios with kings and queens will be created and the fun will never stop! 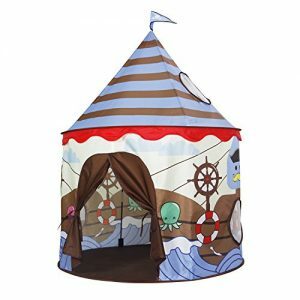 ❤ TOP QUALITY MATERIALS ❤-This splendid kid’s play tent is manufactured from the highest quality polyester on the market. That is why the final product you will receive is strong and extremely easy to clean and will keep your children satisfied for many years to come! 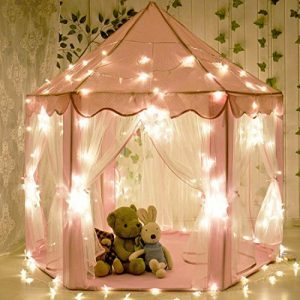 ❤ LARGE DESIGN ❤-We have carefully designed the body of the castle Playhouse to be comfortable and safe for more than one person (40 inch Diameter, 53 inch Height). After all no one wants to play alone. Keep your children and their friends active and occupied with just one toy! GET THE KIDS OUTSIDE In a world driven by technology, it’s easy to get caught up in all the movies, videogames, and learning programs available for children. While understanding technology is important, it’s crucial we make sure our kids get enough outside playtime to enjoy the fresh air. Mother nature has so much to offer. 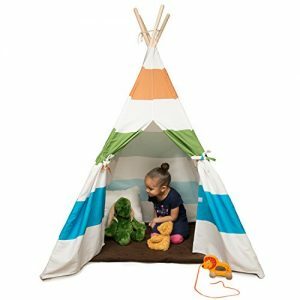 With our teepee tent for children, your kids will be begging to get off the tablets and into their fun teepee tent with mat. The great outdoors never looked so good. 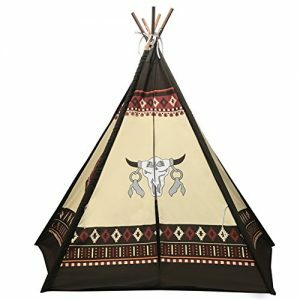 NOTHING BUT THE HIGHEST IN QUALITY FOR YOUR CHILDREN Our canvas teepee tent for kids was crafted with a lot of love and thought put into giving your kids a high quality product. The fabric is a cotton canvas with stitched flooring. The poles are derived from a New Zealand pine wood which has been sanded to a beautiful, smooth finish. 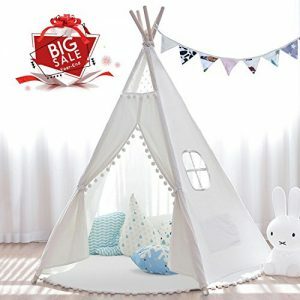 The teepee tent for kids with floor utilizes metal connectors to ensure durability and rubber caps at the ends to eliminate pole slippage and stability. 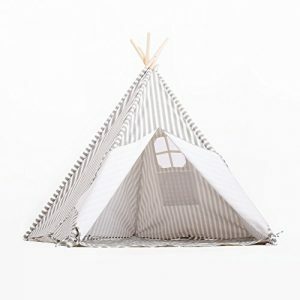 PORTABLE AND AFFORDABLE This portable teepee play tent is easy to assemble and breakdown, making it perfect for indoors and outdoors. 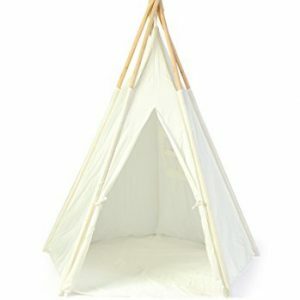 This teepee kit comes with fabric, poles, and stabilizing caps, so it’s a quick and easy setup. Included is a canvas carrying bag, so you can roll up your tent for simple storage and transportation. Take it on playdates, out camping, or just move it from room to room in your house. 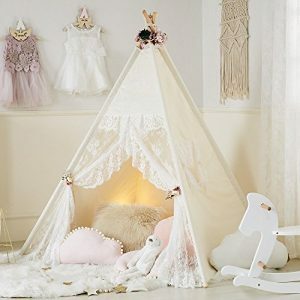 This teepee for toddlers is versatile and perfect for playtime anywhere, anytime. Kids can build any fort they imagine–with these strong, snap-together builders! Stylish and spacious space for your beloved child, can be used both indoor and outdoor. Easy assembly with the accompany with an adult and durable to give you a peace of mind. 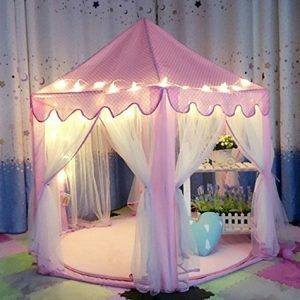 Put on your own decoration for this tent to make it even more beautiful.